One of the greatest, and one of the most witnessed UFO sightings ever recorded, happened on April 6th, 1966 in Melbourne, Victoria, Australia at around 11:00am in the afternoon at what was then Westall high school (now called Westall Secondary College). The sighting had around 200 witnesses ranging from head masters to science teachers to regular students. On the date in question things were as usual at Westall. Some children were playing sports out in the school yard as others were studying, and it was clear out. Then almost out of know where, what was described as a large, siverish colored, saucer shaped disk about the size of two or three cars, came hovering over the school and moved towards a wooded area and then proceeded to land. 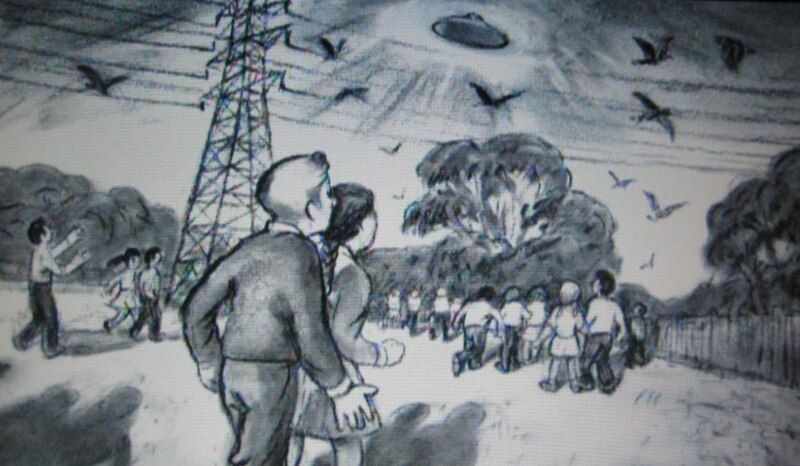 The children at the school, of course were mesmerized as were the teachers on duty, so they jumped the fence towards the wooded area where the UFO had disappeared behind as the teachers told them to return. over to where the UFO had landed while it was still there and was found unconscious and had to be taken away in an ambulance. According to the same witness she never returned to school after that day. Before most of the witnesses could reach where the UFO had landed it had rose up and took off at what they all said was incredible speeds. At which time the witnesses said they saw five other objects, most likely military planes chasing the object. Where the greyish Saucer shaped UFO had landed the grass was flattened in a circle, although no one really knows if it completely landed and after the 20 minute ordeal it was gone. The children where all told to go back to school and head to their respective classes while the police showed up. (And this is where it gets a little odd). The police came and talked to a few of the adult witnesses and then the head master of the school called an unscheduled assembly to talk about what had happened and to tell the students that what they saw was not an extraterrestrial craft but something man made such as a weather balloon and told them not to repeat what they had seen that day to anyone. At the same time the other teachers at the school reported that two men in dark blue suits had come and talked to them about what they saw. The they were also told not to talk about what they saw that day especially to the press. One of the teachers, who had grabbed her camera and snapped dozens of pictures of the saucer shaped object, said that when she was taken aside the men in suits they took her camera and said it was now their property. She also said that the men were from the ASIO (Austrialian Security Intelligence Organization). A science teacher at the school Andrew Greenwood was later visited by officers at his home who threatened him to not say anything under the Official Secrets Act and if he did they would have him fired and discredit him by releasing rumors of him being an alcoholic which he wasn’t. The press from the event was minimal but The Dandenong Journal covered the story and interviewed as many people as would come forward which ended up as a front page story. They also looked into the witnesses accounts of airplanes chasing after the UFO but acourding to commercial and military records there were no planes in the area at the time even though well over a hundred people had seen them. Channel 9 GTV also ran a report on the incident but when UFO investigators later went looking for the tape, that included many different witness accounts, they said that it had been permanently removed from their archives even though that particular T.V. station keeps all of their old stories forever.